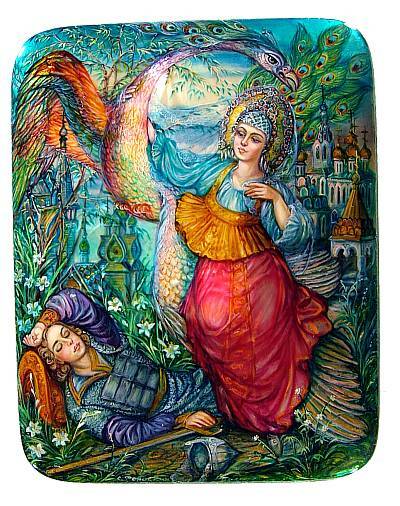 Fedoskino favorite Maria Vagner painted this piece which features an exciting mix of fairy tale characters, bright vivid colors and a mother-of-pearl inlay near the center. To be honest, we don't know exactly which fairy tale she is depicting ("Ivan Tsarevich, the Firebird and the Gray Wolf", maybe?) or perhaps she using her well deserved artistic license and taking elements of several to create this intriguing piece. The Firebird, with his peacock-like plume in back, is magnificent in size and color. 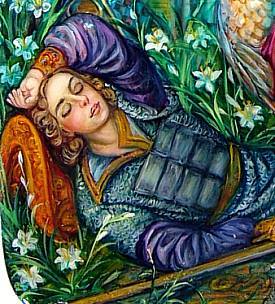 The faces of the beautiful princess and the fallen warrior, meanwhile, are very tender and appealing. The sides and bottom are painted with a mixture of a slightly phosphorescent blue and black, along with just a hint of gold. A small branch of flowers is also painted on the underside of the piece. 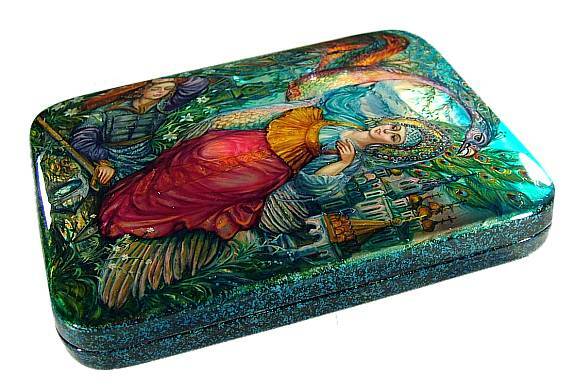 The box is made our of high quality papier mache and has a hinge at the left. It is signed with the name of artist and village. Another great piece from this prominent Fedoskino artist!